3 Things People Pleasers & Rule-Followers Need to Know. When I see a speed radar sign, I naturally accelerate. Keep Off the Grass signs are like invitations to Walk All Over It. And sometimes I’m that person who will tell you what you want to hear…because I want you to like me. But God keeps changing me. The more I read his word and seek to understand what it says, the more I grasp who I really am in Christ, and what it really means to be free. If you are a people-pleasing rule-breaker who desperately tries to be a rule-follower, I hope you’ll find some freedom in these words. 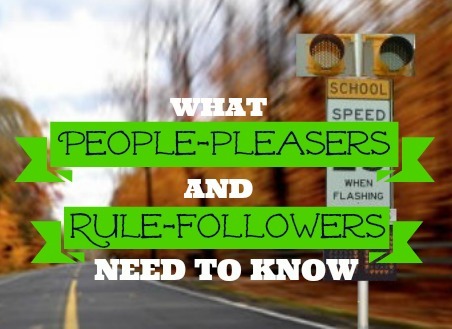 3 Things People Pleasers & Rule-Followers Needs to Know. 1) You cannot earn enough Holy Points to win God’s approval. Because there is no righteousness apart from Christ. You can be as morally straight as they come; you can give money to the church; and do nice things for poor people at Christmas. All this is very kind of you, but it won’t win you one ounce of God’s favor. Righteousness comes by faith alone (Galatians 2:16). Some of us rule-breakers figure out in a hurry that we can never live up to the Law’s impossible standards, so we give up trying. Others (rule-followers) are determined to behave perfectly just in case Jesus was joking. I’ve lived on both sides of that fence, and neither one is all that awesome. Which is why there’s a lot to be said for that faith thing the Bible talks so much about. (2) Popularity is overrated. For years (and by that I mean at least 34), it would stress me out if I knew someone was mad at me. I would lose sleep over the most trivial matters, and would spend far too much time and energy people-pleasing efforts. But I’ve learned (I’m still learning) that if my aim is to be popular, I’m better off not bringing Jesus into the conversation. Because he’s not exactly the most comfortable table topic. Telling the truth tends to generate applause only when it suits the interests of the world. They’ll cheer you on when truth aligns with what they want to hear; and they’ll quickly slam you when reality is uncomfortable. When we’re putting all our eggs in the faith basket (versus our point system), we don’t have to bend the truth out of fear that we might offend someone. But the biggest point here is that since the cross satisfied all our sin debt, and God accepts us in Christ just the way we are. So I’m going to go out on a limb and say that Suzy Q’s opinion of you is not all that world-rocking at the end of the day. (3) The Gospel is not a mini-course in behavior modification. The Gospel is the power for true life change that happens as God transforms us from the inside, out. (Galatians 5:1-5) Jesus isn’t like, “hey, get yourself fixed up and then we’ll talk.” Because hello, we can’t do that on our own. See point #1. Do you value the opinion of others over truth? Do you spend life just trying to be good enough? Are you in need of a breakthrough? Are you at a stand still? Stuck? Personally, professionally or spiritually? Are you looking for something…more? Perhaps God is calling you higher ~ deeper. But to get to that place, you need a breakthrough. More accurately…you need to break through. 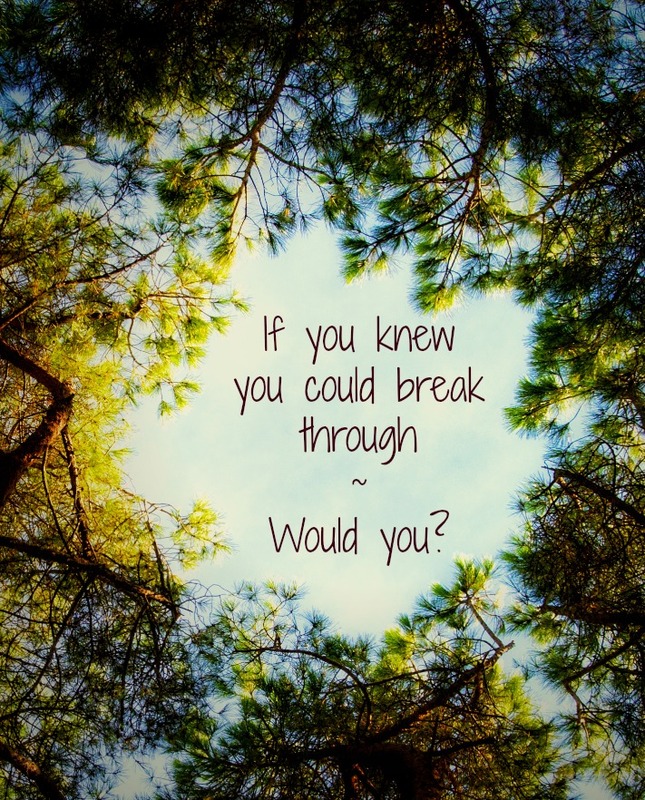 If You Knew You Could Break Through – Would You? I walked my dog, a sweet little Golden Doodle named Beaux, this morning. It’s part of our daily routine. Today, we walked a route through the neighborhood we sometimes, but not always, go. As we moved past a certain house with a fenced-in back yard we heard a dog. We are accustomed to hearing barking dogs as we walk …they envy Beaux’ out-from-behind-the-fence freedom. Usually, their barks are like the sound of cymbals mixed within a symphony of bird song that blesses us along our way. This time though, the barking didn’t ‘ching’ as though finger cymbals being played by a delighted child. This time they sounded more like the heavy yet abrupt ‘chong’, ‘chong’, ‘chong’ of heavy metal briefly grating against itself ~ not quite as cheery. If you knew you could. Some people are physically, mentally or spiritually held captive in extreme circumstances that would seem impossible to overcome. But even Dr. Viktor Frankl, in just such a situation as a prisoner and survivor of the Nazi concentration camps, kept himself alive and helped others do the same by focusing on one day again becoming involved in and completing a project they enjoyed or hugging someone they loved. Instead of focusing on darkness, death, hatred, and blame they deliberately chose to focus on their purpose. We do not have to experience Auschwitz to be imprisoned mind, body, and Spirit. There are things that keep us from being all God has intended…they restrain us and we must be deliberate in seeking freedom. Breakthrough. It is a decision to take action and be accountable. It is a willingness to surrender, count the cost, pay the price, and experience the struggle of overcoming and pushing through to a higher, deeper place focused on God and His purposes for our lives. Can we let go of our well-worn paths and follow the one less traveled? …Discovering destiny is far from passive. 1. Is there a negative life pattern, thought, habit or belief that is holding you back ~ keeping you from a breakthrough? If so, what is it? 2. Are you too comfortable with ‘business as usual’, yet there is something on your heart God prepared for you to do that you aren’t doing? 3. Who or what is stopping you from making your God-designed contributions? Comfort? Fear? Others? 4. What leverage do you have that gives you an advantage to accomplish your purposes? 5. What is the next step to drawing closer to breakthrough and discovering that something calling your name? 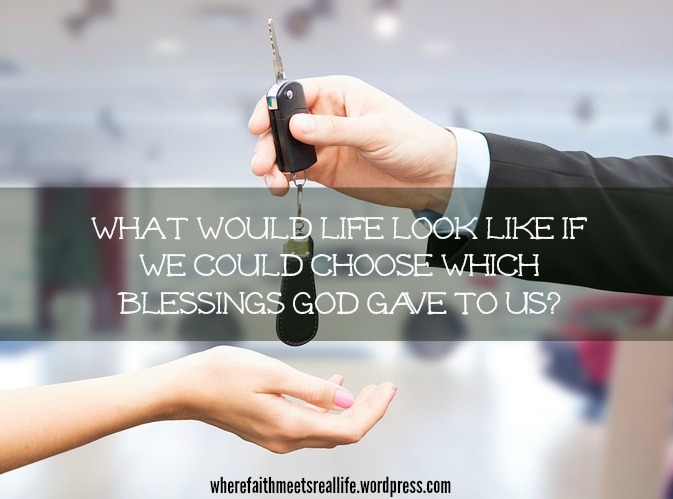 Can We Pick How God Blesses Us? A few weeks ago, my family attended a home school convention in Arlington, Texas. Among the various presenters and speakers, were the man behind Hank the Cowdog and the Duggars. Not all the Duggars were present. But, 17 of 19 isn’t bad. For a family with the highest rated show on TLC, they were pretty down to Earth. They were friendly and approachable. Interestingly, they even put their kids in the kids convention. Zoe, Lexi and Isaac were awestruck when they actually playing with some of the same kids that they watch on TV. During their talk, Michelle Duggar quoted Psalm 127:3 “Children are a gift from the Lord; they are a reward from him.” I don’t know why that surprised me. After all, she has 19 kids! But, it really did get me thinking. Do I believe that? Are children a gift from God? I know there are times when I may question it. It would be a gift if they put their shoes away, turned off the lights, and FLUSHED! But, if I believe children are a gift from God, then I may have (literally) cut off one (or two) avenue(s) for God to bless me. After Isaac was born, I promptly contacted my local neighborhood urologist and scheduled a vasectomy. For those who don’t know what it is…….well, it is a whole lot of “Your gonna what?” mixed with some “I can’t watch” and just a dash of “Are you done?” Which is then followed by a week of frozen peas. But, by deciding to undergo that procedure, I probably got in the way of God’s blessing. The reasons that I used to justify the decision are the same used by many: costs associated with food, clothing, schooling; will we have space; etc. In retrospect, most of these concerns factor around money. And, more clear to me know, a failure on my part to put my faith in God to handle these concerns. Not surprising really, is it? It started in Genesis. God creates heavens and the Earth. He puts man in the garden, gives him a wife, and sets forth to bless him for eternity thanks to the Tree of Life. He only gave him one commandment. That’s right, don’t eat from one tree. God wants to bless us. He desires to bless us even more. In exchange, what does he ask for in return? Faith. How do we respond to this challenge? I am not saying that placing your faith in God is easy. It goes against everything we are taught growing up or experience on a daily basis. Just as I did six years ago, I struggle with it and still often think I know what is best for me. My prayer for everyone is that you “Trust in the Lord with all your heart and lean not on your own understanding; in all your ways submit to him, and he will make your paths straight.” Proverbs 3:5-6. True identity is not what the people and circumstances of life say that it is. Your true identity is found in the eyes of your heavenly Father…the One to Whom you belong. In the song, Abba, the artist shares the following as a prelude to his music. “I wrote this song from a prayer of Brennan Manning. The prayer begins with the word ‘Abba’, which means daddy, papa, my dear father. Dear one, what ever your relationship with your earthly father, the reality you must surrender to is this; as a follower of Christ your true identity is found solely in the loving, wise, forgiving, patient, kind, just, and unshakeable eyes of God. While the wounds of life may create scars that cause your true identity to be difficult to remember, accept, or live out ~ the truth remains the truth. 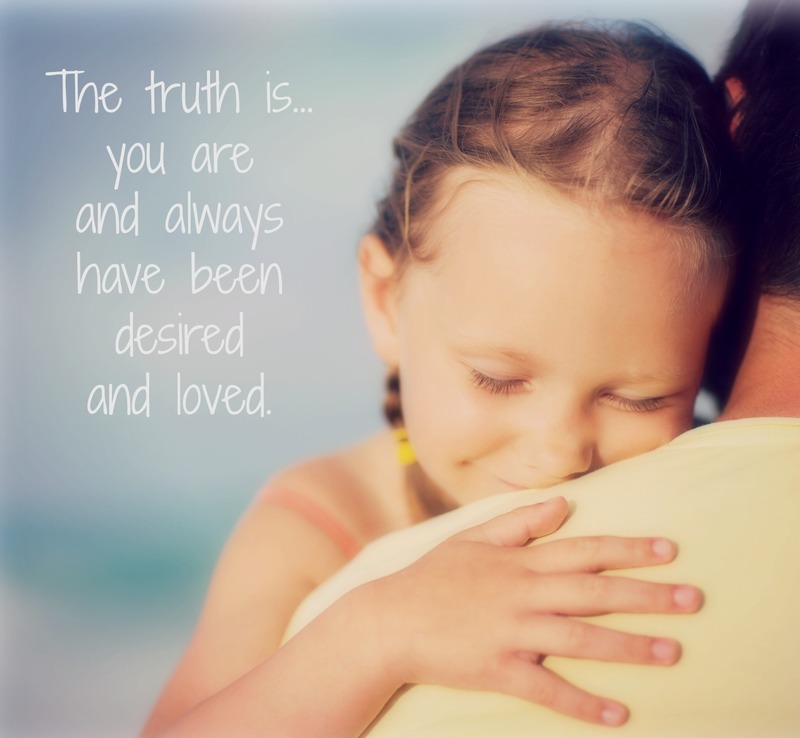 You are and always have been desired and loved…by your earthly father, perhaps…I hope so. By your heavenly Father, there is no doubt. You were imagined and created because God wanted you to be and to live. He wants you to know him, spend time with him, and love him. He wants you to understand that in this sometimes tired and often dreary world there is a place where you belong because you are his. Every little girl desires her father’s attention. She seeks his undying love. She hopes beyond hope to see his joy as she captivates his heart. It’s the way God set things up. A girl finds her first taste of confidence, value, and hope as she seeks and finds her true identity in the mirror of her father’s eyes. Unfortunately, not every earthly father lives up to his calling. Not every little girl receives her father’s love as she should. But, every little girl does have a heavenly Father that is enchanted by her. He cherishes her ~ even the very thought of her. He desires deeply that she spend time with him and know him well. So well, she knows him by heart. and they bade each other good-bye. in her small hands and looked long and hard at his face. Perhaps little Sara didn’t know what simple and deep truths she spoke. If and when your earthly father is far from you or perhaps, not the father every little girl deserves, know this…your Abba, Father is so close to you that his Spirit resides in you. He is always with you…inside your heart…ready to be known. And as only the King of Kings can, he patiently waits for you to call on him that he may listen, guide, direct, and love you unconditionally. So, as you look hard into his face…dwell on the reflection captured in his eyes. For you are his child. This Father’s Day, crawl into your Abba, Father’s lap. Stare into his eyes and realize ~ this is the One to Whom you belong. Know him by heart and receive your true identity. Abba, Father, thank you that you love me unconditionally. Thank you that your desire is to spend time with me, to know me, and to claim me as you precious child. I pray always and only to find my worth and true identity in your eyes. In Jesus’ name, Amen. Listen to your HeartSong below, Abba. Find a quiet place and breathe in, Abba, and exhale, I belong to you. Accept God’s invitation to belong to him your papa, daddy, and dear father. Discover your true identity in your Father’s eyes. 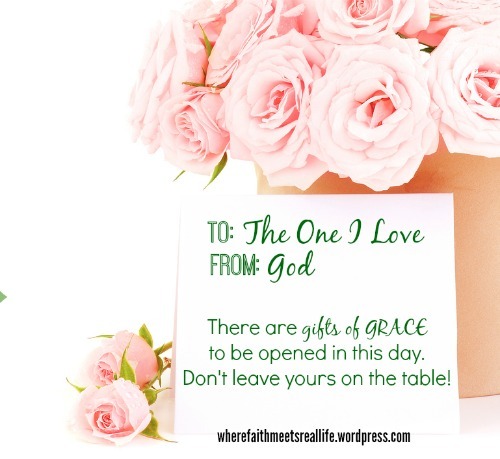 How are you experiencing these 3 gifts of Grace? I did something this morning that thrills my heart. I bought something for someone. These are the reasons for my joyful anticipation. 1. This person is not related to me. In fact I spend less than an hour a week with her. We never talk on the phone or meet for coffee. 2. It is not for any special occasion. 3. It is totally unexpected. 4. I know that she will treasure it, because it is something in which she places great value. 5. She will use it every day. 6. It is something she would probably never purchase for herself. These are the reasons that I especially chose this gift for her. What I am finding is that my joy in giving it may far exceed her joy in receiving it though I expect I’ll see tears of joy when I give it to her. I tell you this because it made me think. It made me remember. I thought about how the manifestations of God’s grace toward me is like this. He chooses them especially for me when I least expect them. They are memories of great value that I truly treasure. I never ask for them, but joyfully receive them with humility and gratitude. I remember three of these special gifts specifically. These three gifts of God’s grace given to me the very real POWER, PEACE, and PRESENCE of my Heavenly Father directed to me; His full, undivided attention lavished on me, His beloved child. The first gift, reminding me of His power, happened thirty years ago. As I lay in my hammock under a huge native pecan tree in my yard, I gazed into the night sky. There were no clouds or lights to obscure or dim my view of millions of stars in the vastness of space. As I prayed and worshiped the Creator and Sovereign Ruler of this vast universe, I was humbled as I pondered how small and insignificant man is. In awe of Him, I began to say to Him, “You are so great and powerful; with your very word You can hurl one of these stars across the heavens”. I was halfway through my sentence when before my eyes a star streaked across the dark sky. I remember the joy that filled my heart because I knew that this Powerful God, who created everything, heard me and wanted to show me that He hears me. The second gift represented His peace. This gift of grace was given to me last August while I was on a vacation that was anything but restful. None of my plans had worked out. I was not happy, complaining, and feeling alone. To say I was not content is an understatement. However, God was working on my attitude the entire week. By the end of the week my attitude had changed. After a week of quality time with God I was grateful. As I was enjoying my last full day on the beach I waded out into the water which was very calm until I was in neck deep. I was facing the shore, having a last look at the activity on the beach. I turned around to look out toward the horizon and was startled when I saw, almost within arms length from me, a huge creature staring at me. (According to a guy who was about fifty yards from me, he had been “checking me out” for a while). It was a manatee. He was magnificent! I didn’t even know what a manatee was, much less anything about them. When I googled it I learned that they are considered to be the most peaceful of sea creatures. God gave me a visual of the peace that is mine in Christ; the peace that transformed my discontent to contentment that week. The last gift was given a couple of months later in October. It is a gift to remind me that He is always present, even in the mundane, seemingly insignificant moments of everyday life. I was at a retreat, working in the conference room as we served thirty-five women hoping for spiritual blessing. I looked outside and saw two of these women and two workers searching the grassy area for something. I went out to them and learned that one of the ladies had lost a gold loop earring. After searching for several more minutes the two ladies went back in the the conference room and the workers left to search the last place she had been. I told them I would continue to look for the earring. After several more loops of the area, I stopped. I prayed. I told God that this earring was important to this lady. (Like He didn’t know)! I said, “I don’t know where it is. You know where it is. It is impossible for me to find it in this grass and leaves. So when I find it I will know it is You who showed me”. I took one step, looked down, and there under a leaf I saw half of a gold earring. He showed me that He was present in that moment, caring and compassionate. When I take the time to think and to remember God’s personal, unexpected gifts of grace, designed especially for me, and given to me with love, I am filled with great joy and gratitude once again. It causes my heart to sing songs of praise and worship to the lover of my soul. I AM CONVINCED THAT HIS JOY IN GIVING IS GREATER THAN MY JOY IN RECEIVING. I hope this will encourage you to take time to remember the special gifts of grace that God has given you so that you will be filled with joy and be inspired to praise and worship the Lover of your soul. We were a small country church where average Sunday night attendance was roughly 45-50 people. 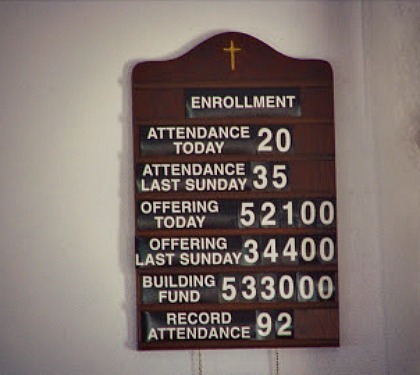 One of my most clear memories of the church sanctuary (besides the yellowish orange carpet) is of the two attendance boards that were prominently displayed on the walls behind the pulpit. We had a Training Union Secretary who went from class to class to take attendance and account for the number of Daily Bible Readers. From as early as I can remember, I proudly raised my hand in answer to that question. And on those weeks when the adults and kids remained in one group, I reveled in the approving looks the adults would give this 9 year old. I haven’t thought about that Training Union scoreboard in years. Until it recently came to mind as I thought about my tendency to think I have to earn God’s approval. 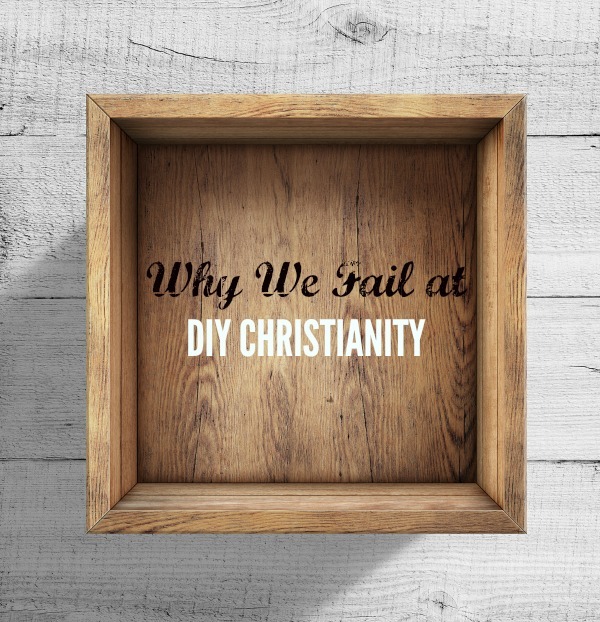 Nearly 30 years following my childhood entry into the Christian scoreboard system, I’ve finally realized why I continually fail at DIY Christianity: because it’s not even possible! The Gospel of Jesus Christ is not a do-it-yourself project. The Gospel is not a Cross + My Efforts = Righteousness kind of equation. We know the churches in Galatia struggled with this same issue, because the Apostle Paul’s letter to this group addressed it head-on. After Paul had introduced the Gospel of Christ to the Galatians, a group of religious rule-followers came in to put a different spin on the message. They insisted that adhering to traditional religious standards was necessary in order to be considered righteous. Paul makes it clear in his letter that the gospel of Jesus Christ is not a man-made tradition; and it’s not a club that demands an entry price of good behavior. Rather, the gospel of Jesus Christ is this: we are saved because of God’s sheer generosity towards us in Christ. There is no good behavior addendum; and there is no fine print requiring extra holy points. Mainly because WE CANNOT EVER BE HOLY ON OUR OWN! But still. I want to check boxes and keep score, and have some measure of how well I’m doing with the Holy Living. I want a scoreboard for crying out loud! So the gospel gets twisted into DIY Christianity: Jesus + Rule-Following + Good behavior = Righteousness. Which means that if I’m not careful, all my “religious” activity (studying aka Daily Bible Reading, teaching, serving, church attendance) can easily slip into performance mode. That kind of thinking ultimately translates to “God is happy with me as long as I’m performing well”. But if there is any kind of failure or weakness in any of these areas, I’ve basically failed at righteousness altogether. Thank the Lord that grace tells a completely different story. Because here’s the truth: any man, method, or measure of salvation apart from Jesus Christ is false. Be done with chasing Good Enough…because you already are. And if you’re working to put up numbers on a church scoreboard…close the lid on that game. And frankly, that’s the point. God has a vision for your life, should you choose to accept it. His vision for you is uniquely and utterly yours. God desires you, and only you, to walk a certain path with excellence ministering to a broken world. He wants you to participate in fulfilling His purposes and at the same time, yours. 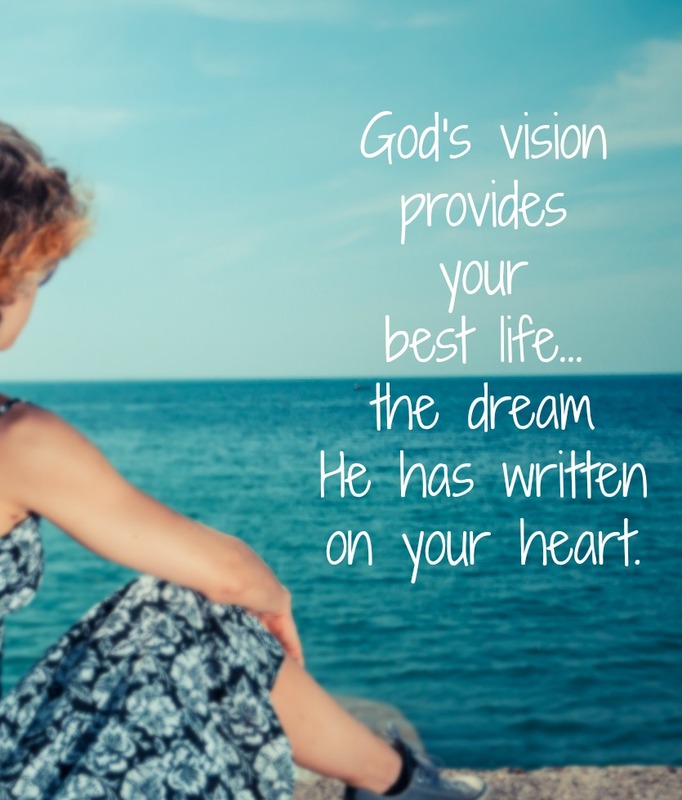 Not surprisingly, as God is so good, His vision provides your best life…the dream He has written on your heart. God’s vision for your life – How do you know? To begin with, the foundation for the vision of our lives is something you probably already know: to love God and love our neighbors. Then, there is this…go and make disciples. Like Abraham, Daniel, Jeremiah, Moses, Deborah, Jacob, Mary, Paul, Jesus (and the list goes on…), your vision will require action and will affect lives of those you may never know. God’s vision is much bigger than the car, vacation, home, fame, career or savings account you may wish for. When God reveals His vision to you, you will know it is what you were born to do. God’s vision is His way for you to tell the world what is on your heart…what is on His heart through you. It puts to work your spiritual gifts in ways that bring heaven to earth. It glorifies God’s name. Don’t despair if you haven’t caught a glimpse of God’s vision for your life yet…wait. When the time is right, He will reveal it. In the mean time, you have daily purposes to undertake, obstacles to overcome and patience, obedience, perseverance, humility, faith, and love to grow. It could be you’d rather not know God’s vision for your life. It may require more faith than you believe you have. You may be afraid you must surrender too much and make changes you’d rather not make in order to step forward. If that’s the case, please know this: whatever you surrender of yourself, things, or time in order to accomplish God’s vision makes room for more of Him in your life and allows you to become more of who He created you to be. While you give yourself up to Him, you are filled up with Him. A great faith will bring heaven to your soul. Maybe you think it’s too late to know and accomplish God’s vision. May I remind you that for years Sarah desperately yearned for a child and was 90 years old when Isaac was born? Apparently, God had a few other things and people to prepare including teaching Sarah (and Abraham as well) what was necessary. In His time, He brought Sarah’s dream to fruition while fulfilling His purposes. It is not too late and you are not too old to accomplish God’s vision. It could be you’ve already captured God’s vision. If you are in that place, you know it takes perseverance and faith to go where God is calling you. Have you stopped short of realizing your vision out of fear? Honestly, it will cost you everything as you are spent in the service of the Lord. It will require you to push out of your comfort zone to a place where you can rely only on God. Yet, do not let fear stop you! For as Jesus reminds us ~ with God, nothing is impossible! Continue seeking and stepping forward into your dream. For there is no more joy, no more meaning, no more passion, no better place to be than bringing light to darkness in the way only you can. It is what you were gifted and meant to do. It is the tremendous blessing and source of fulfillment you’ve been seeking. Proverbs 29:18 tells us, “Where there is no vision, the people perish.” God has a vision for you…an out-of-this-world-desire for your life should you choose to accept it. He wants you to live the dream He has written on your heart ~ your best life. 1. Request God reveal His vision. He may have already given you ‘sneak previews’ in your childhood or through deep-seeded wishes or an undeniable longing of the heart. In any case, son’t be shy. Ask. 2. Be receptive. If you desire to know God’s vision for your life, be willing to accept it. 3. Pray with confidence. Ask God to increase your faith and clarity so when your vision is revealed it is apparent. Believe God will answer your prayers. 4. Be patient. God’s timing is perfect. While you wait, find out the needs of your church or community and see how ministering to others might spark a light in your heart. 5. Listen for God’s answer. It may come through scripture, other people, circumstances or a combination of the above. Be still. Listen to what the Holy Spirit speaks to your heart. 6. Expect to Receive. Do you really expect God to speak? Are you willing to receive His vision? Remember, the dream is supposed to be big so God can equip you ~ for nothing is impossible with God. Lord, thank you that you have a vision for my life – one that allows me to help build your kingdom on earth and glorify your name. I pray to listen for your direction. I pray I accept your will and obey. In Jesus’ name, Amen. Listen to Your HeartSong – Click the link below!